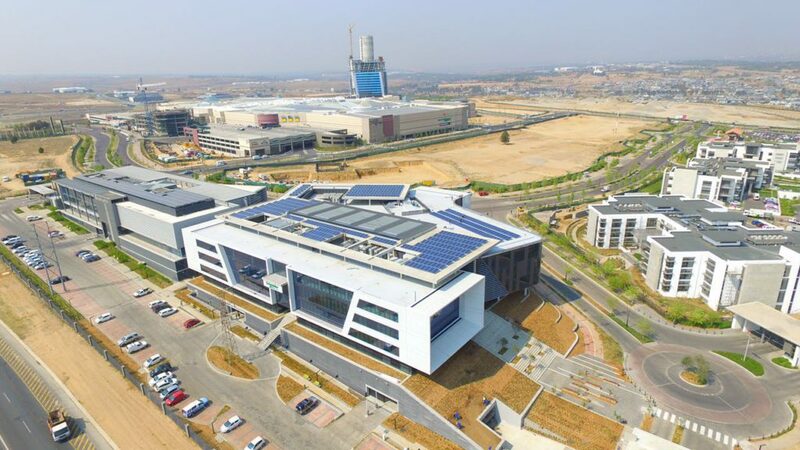 Two new green buildings are setting benchmarks for sustainable development in the Waterfall area – the Attacq/Schneider Electric office building is targeting a LEED Gold certification while the Waterfall Public Transport Holding Facility is the first project to achieve a 5-Star Green Star SA PEB v1 rating. To avoid excessive excavation, a podium was created to deal with the site’s slope, which also elevates the building and gives it a strong presence and sense of entrance. The star-shape generated by the five-sided site defined the shape of the atrium, which is enclosed with internal shopfronts between the tenant spaces and atrium itself in order to control the temperature and indoor environmental quality (IEQ) of the tenant spaces more effectively. The building has been optimised in terms of systems and building elements – such as performance glazing, insulation, high SRI roof coatings, and lighting controls – to reduce energy consumption by 54% compared to baseline. A solar PV installation on the roof also provides 21% (by cost) of the building’s energy needs. the specification of low VOC paints, floor finishes and adhesives in the interior to improve indoor environmental quality and occupant health. In addition, detailed waste-management and site-pollution plans were implemented during construction to reduce the amount of waste to landfill. A third-party commissioning agent Ecolution was appointed to optimise the design and ensure that commissioning of the renewable energy, hot water, lighting control, BMS, daylighting control and HVAC systems was carried out according to ASHRAE guidelines. We believe LEED to be the right rating tool to be used on buildings of this nature. The LEED system is rigorous in terms of ensuring that actual performance objectives are met through the commissioning of building. It focuses on the construction process as well as the end result, so it’s a reliable system all round in terms of ensuring quality control and a superior end product. As part of the Midrand Waterfall Development, Attacq was required by the local government to build a public-transport holding facility to provide a base for the various modes of public transport operating in the area. 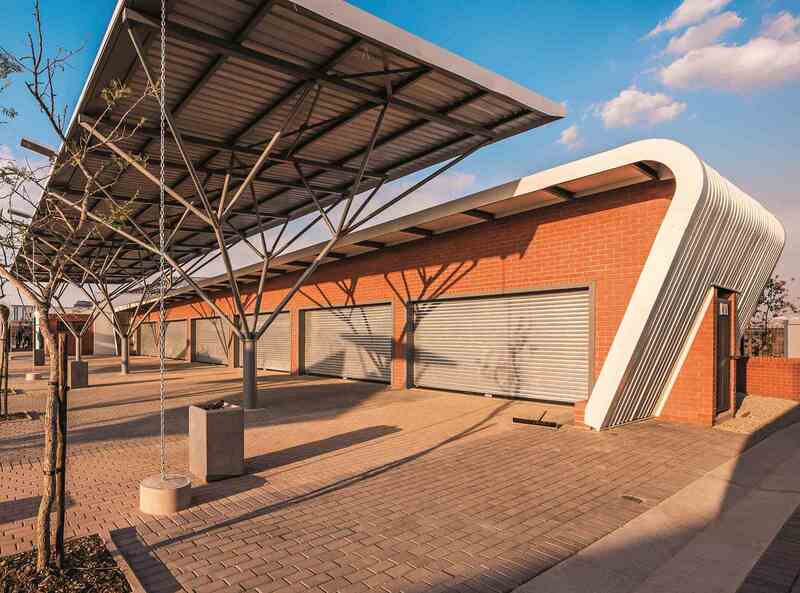 Located on the east side of the N1, adjacent to the quarry on Waterfall Farm, the development consists of offices, a canteen area, an ablution area, a refuse area and a transport facility parking area. Sean Pillan of Empowered Spaces Architects says that different zones were designed to accommodate the different functions required, and each building was oriented to create visual security around a central courtyard which functions as a rest and meeting area for drivers. Four planters on the edge of the courtyard provide partially shaded seating and act as a buffer between the exit road and the courtyard. These planters attempt to soften the hard edges around the facility, and have built-in USB ports for drivers to charge their cell phones. 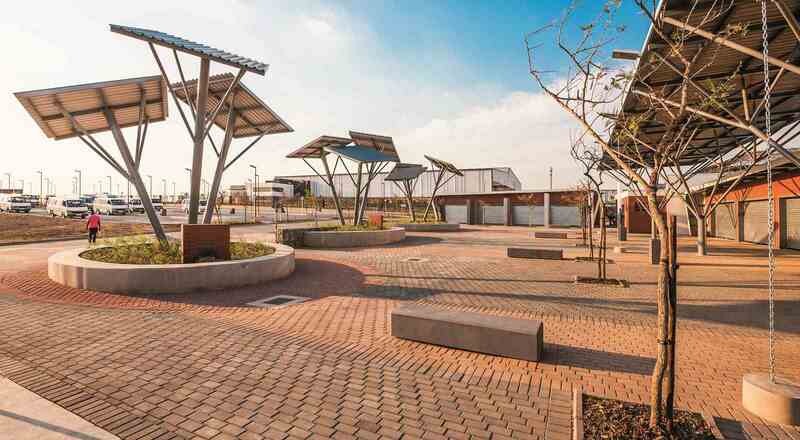 This rest area opens up to the south side of the site and offers views overlooking Johannesburg. a dedicated refuse area includes a sorting facility for street recyclers to sort through refuse materials in a secure area, out of sight of the street – this area is also provided with posters to encourage and educate users on what materials can be reused and recycled. Large overhangs on the building blur the distinction between interior and exterior spaces. Hardscape surfaces and roofing material with qualifying Solar Reflectance Index (SRI) values were chosen to minimise the urban heat-island effect; and robust materials such as sheeting, steel and face brick were chosen for easy maintenance. Clearvu fencing has been used on the ablution block and canteen for security, as well as for maximum cross ventilation and natural light. The building is completely off grid, with a solar PV installation located on top of the ablution block to provide power for the offices, canteen and refuse area. Solid Green’s Annelidé Sherratt reveals that this installation is capable of producing 6 177 kWh of electricity, resulting in a net positive building. The horizontal zoning of the building eliminates the need for vertical circulation and water-heating facilities, which also saves energy. All sustainable building features have been incorporated in such a way to educate building occupants on how the sustainability initiatives implemented in the building work, and the associated environmental benefits of these initiatives. Water-efficient sanitary fittings have been specified, and water and energy consumption results available from energy and water sub-meters are displayed on a dedicated screen for public viewing. In addition, a Building Users’ Guide was developed: to inform visitors and staff working in the building of relevant building operations that influence them and on which they have an effect; to provide information on management systems that optimise the building’s environmental performance; and to ensure that all future alterations, additions and programme changes adhere to the intent of the Guide. With very different scales and functions, these two buildings demonstrate that green building is quickly becoming the new ‘business as usual’ across all building typologies.